We offer complimentary Las Vegas hotel pick-ups at every major strip hotel. Please click on the link to view our pick-up locations. We offer free cancellation up to 24 hours from the scheduled pick-up time. Cancellations received less than 24 hours will not be refunded. To cancel or change your reservation, please email info@grandcanyontourcoach.com or call/text 702-840-7888. All tour pricing is inclusive of all fees or charges. Don’t be fooled by other tour operators that tack on extra fees after your purchase. Additional items are available for purchase on the day of your tour and will be available from your driver-guide. Are Grand Canyon West Rim Skywalk experience tickets included in the tour price? Tickets are not included in the price of the Grand Canyon bus tour. However, you can purchase on the day of your tour directly from your driver-guide. Do you stop at the Hoover Dam? We do include a stop at the Hoover Dam. This stop allows you to stretch your legs and capture amazing photos (approximately 15 to 20 minutes). How much time does the tour spend at the Grand Canyon? Our Grand Canyon South Rim bus tour spends the most amount of time in the Grand Canyon of any tour company. It’s approximately 3 hours. Our Grand Canyon West Rim bus tour spends almost 4 full hours at the Grand Canyon. The most of any Grand Canyon tour operator. Does the tour include food and beverage? On each trip, we provide bottled water for guests. A light breakfast snack and lunch is provided on day trips to the Grand Canyon. Do driver guides accept gratuity? Tips are accepted and appreciated for a job well done. Do you have to be in great shape to visit the Grand Canyon? Our day trips are designed to avoid any strenuous climbing, jumping, or hiking. You will have a few hours to move at a comfortable and safe pace. Guests do not have to be extremely athletic to sightsee on our day trips. What time do your tours begin? Hotel pickup begins at approximately 6:00 am. 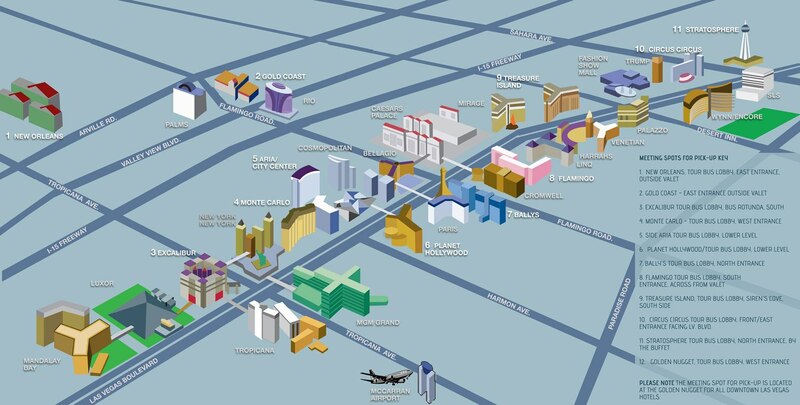 Upon receiving your reservation you will receive your exact pickup time and location at your Las Vegas Strip hotel. A re-confirmation will be sent to you the day before your selected Grand Canyon Tour. Please bring a government-issued photo ID on your tour. Other packing suggestions include beverages with a screw-on cap, sunscreen, sunglasses, and cash or credit cards if you plan on purchasing souvenirs. Most importantly, bring your camera to capture and preserve beautiful memories. What should we wear to the Grand Canyon? We recommend comfortable walking shoes and for the summer months wear sunblock and hats for protection. Dressing in layers is also suggested as summer monsoon storms are common. For the winter months’ dress in warm clothing. Is luggage allowed on the luxury tour bus? No luggage is allowed on our luxury tour buses. However, you may bring with you small backpacks or handbags due to the security restrictions at the Hoover Dam. Is there a bathroom located on the bus? Yes, for your convenience, there is a unisex restroom is located on the tour bus. How many people do your tour coaches seat? Our tour buses may seat up to 56 guests with comfortable reclining chairs and footrests. Each seat has access to panoramic views of the trip. Do your tour buses have seatbelts? Yes, every seat on the tour bus has lap belts. We always encourage you to stay buckled when in motion for your safety on our tours. Do your tour coaches have air conditioning and heating? Does the bus have free WiFi? Yes, the WiFi is provided free of charge, although it is dependent upon a clear phone signal throughout the trip. How far in advance should we make our reservations? It’s best to make your reservations as soon as your travel dates are set. This is one of the most popular tours to the Grand Canyon and we do sell out. Be sure to make your reservation today, especially during popular and seasonal dates. There are capacity limits on most tours and the closer to the date, the more likely it is of being sold out. Does my child need a seat, too? Guests under 2 years old traveling with an adult that has purchased a ticket, is NOT required to purchase a seat. The adult can carry them in your lap free of charge. Please note, the snack will not be provided for the lap child. Children may not travel alone and must be with an adult or guardian at least 18 years old. We accommodate guests using a wheelchair. Our tour buses have a wheelchair lift. There is an option to lift the customer with their wheelchair seat or just alone. We can remove the seats to have enough space for the guest. Where will I be picked up if I am staying at a private residence? Our luxury coaches are often too large to get into regular neighborhoods. If you are staying in a private residence or airbnb you’ll need to make your own way to one of our Las Vegas Strip Hotel Pickups, we can assist you in finding the closest to you during the reservation process. Is there a tour guide on the bus tours? All our bus drivers are knowledgeable on tours and information. They will narrate throughout all of the available Grand Canyon tours. Please bring your questions and try to stump our expert guides. Can I reserve the front seats on the bus? We do not reserve seats on the bus. But if you do have a special request, please submit at the time of reservation. We will try our best to accommodate. Will delays due to traffic shorten our time at the Grand Canyon? We guarantee our 3 hour stop at the grand canyon for all our customers. Traffic may result in a later return to your hotel but your grand canyon experience will not be affected. Is smoking allowed while traveling? Is alcohol allowed on the bus? There is no smoking allowed on the bus. However, you can smoke outside of the bus during stops. There is no alcohol allowed on any of the Grand Canyon/ Hoover Dam bus tours. Can you drop me off at the Grand Canyon South Rim and pick me up the next day? We can accommodate the travel, but each guest would have to purchase two full-day tickets.